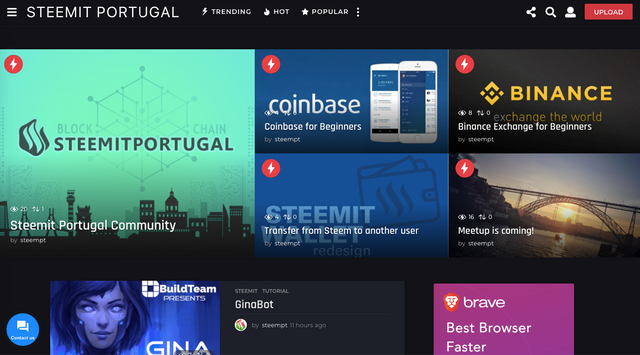 The Portuguese @steemitportugal community is to be congratulated for the development of the WebSite www.steemitportugal.com. This website was developed by members @portugalcoin and @warnas. Thank you for your work! The focus of this website is to assist all steemit users with various tutorials. So for less experienced users, you have a website that can help you understand the Steemit platform. We're still putting content on the site, so anyone who has ideas or even wants to help sign up for the website and create a tutorial. The @steemitportugal team is developing the integration of the site with the Steemit platform . That is, have the possibility to create a post on the site and automatically publish on the Steemit platform. However, there will be an approval check for all content that will be created on the site. Many thanks to all the members who are contributing to a strong and united community! The account @steemitportugal at this moment is witness however we have not done the post of disclosure because we are organizing our project in a better way to present to the entire steemit community. However, if you want to give your vote, just click on the link below. THANK YOU! Very cool developments. Amazing work. Let's put Portugal on the Steem Map!